This cross-section is very similar to an earlier Laird-built paddle steamer, Denbigh. 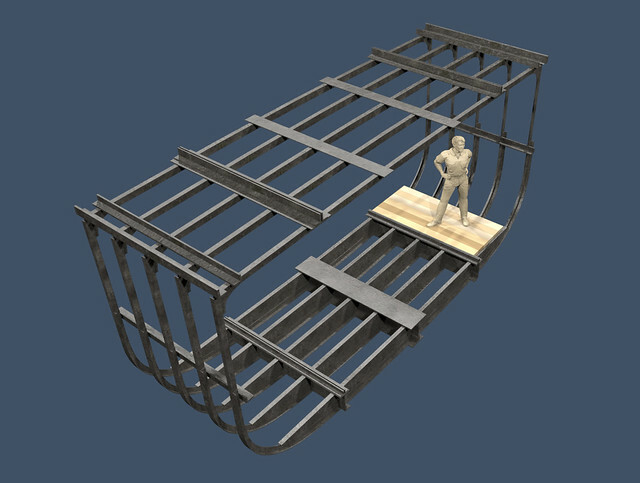 Around the outer edge of the hull are notations of plate thicknesses, and the column at right tallies up weights. The spacing of the frames at 21 inches is a bit more than the standard 18 inches, suggesting a willingness to trade structural strength for a saving of weight. We read recently about Wren‘s eventful arrival here in early February 1865; Lark‘s story will be told in due time. Great illustration, thanks. The museum is very nice. I did some research there last spring and enjoyed looking at the exhibits…. Think you might need to make a slight correction there. Time-travelling blockade runners would make for an entertaining bit of steampunk, though. With that narrow beam, shallow draft and flat bottom, I’ll bet they were lively rides in a heavy gale.